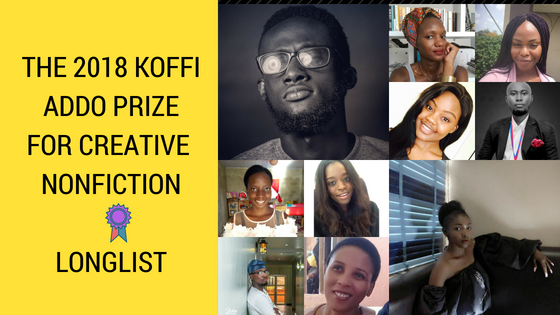 The Koffi Addo Prize for Creative Nonfiction 2018 longlist has been announced. The Koffi Addo Writivism Prize for Creative Non Fiction Prize is named after Nana Koffi Addo a Ghanaian who was born on 6th May 1921 in Abetifi, Kwahu and passed on, the 2nd of December 2011. Addo had numerous articles published in various magazines and left behind 3 unpublished manuscripts including “Guidance for Young Women”. The prize administrated by Writivism Literary Initiative first ran in 2016 and was only open to Ghanaian writers. It would be won by Accra based yoga instructor S.Y Tetteh for her piece Lost Futures Or: A Guide to Losing Love. The second edition of the prize was open to writers from the whole continent and would be won by South African writer Charles King for his story Meat Bomb. Previous Previous post: Writivism Short Story Prize 2018 longlist announced. Next Next post: Hawa Jande Golakai, Muthoni Wa Gichuru star at Literary Crossroads.